As your connected customers interact with your brand in new ways, it becomes more difficult to understand who they are, what they want and what they're likely to do next. More connections and channels can be a shifting landscape, but this new territory also gives you new opportunities for meaningful customer communications. Analytics is the key to understanding your Generation C customers-the "C" for connected-and marketing to their interests. A sound customer analytics practice enables you to pinpoint high-value, high-response customer segments and drive revenue with personalized interactive marketing. 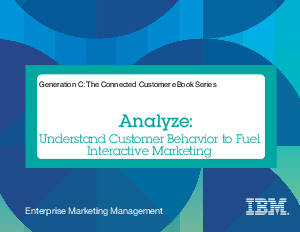 Read on to understand customer behavior fuel interactive marketing.